Growing up, Kai and Grace have always been close, but while Kai has always been more serious, Grace is free spirited and longs to see beyond the horizon. When the two find themselves on their own and Kai professes his love for Grace, Grace rejects his love in fear. Later that night, when the legendary Winter Child shows up, Kai goes with her willingly, leaving Grace behind. Grace is shocked when Kai is missing, and filled with determination to find him. So she sets out on a journey across the countryside and the vast land of ice and snow to find Kai...but her journey soon becomes so much more than just a quest for a missing friend. 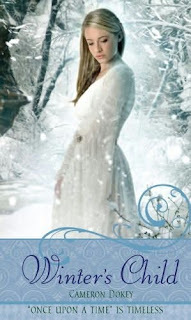 Winter’s Child, the latest book in the Once Upon a Time series, retells the lesser known fairy tale “The Snow Queen”. As always, Dokey fills the story with her magical style and vivid storytelling that makes her characters so engaging and the stories so intriguing. Told in twelve parts, Winter's Child is narrated from the point of view of all three main characters, Grace, Kai, and the Winter Child, making for a read that moves quickly and is never boring. The only complaint would be that the novel is too short. It might have been more entertaining if it had more details, or if the plot was slightly more complex. The romance in the story is very light, and each character ends with their own happily ever after, though there is little romance or courting leading up to the ending. Despite this, Winter's Child is an enjoyable book that will appeal to younger teens or older ones looking for a nice and sweet escape from every day life. Cover Comments: As disappointed as I am that these books have gotten a new look and no longer wear Kinuko Y. Craft's beautiful artwork, I do admit that I like the new design and can recognize how it might appeal to more people. I like this cover's concept, though the girl looks a little too modern to belong on this particular cover, and she doesn't quite fit the Winter Child's description. But the title treatment is really nice, and the snowy landscape fits. This book sounds lovely and the cover is just as gorgeous. Ooh... I love the story of the Snow Queen. I might have to check this one out! Totally agree with you about the covers. And yet a (traitorous) part of me likes the new covers too. I love the Once Upon a Time series, I haven't read this one yet but look forward to it. Good review! i have read this book. its absaloutley amazing and completely drew my attention when i read the first paragraph. its a mix of alot of things and i think her idea of making oma tell a story and have it come true is absaloutley amazing.